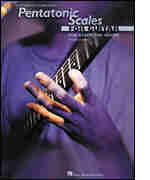 This book provides the pentatonic scale fingerings, diagrams, lessons and licks that every guitarist needs to know. It covers: major and minor pentatonic scale patterns in all positions; licks in the styles of Chuck Berry, Eric Clapton, Jimi Hendrix, B.B. King, Jimmy Page and more. The CD includes 90 full-band demos.